We have parking on the street as well as utilizing the Inman Park MARTA stations' parking lot cater-corner to the restaurant. 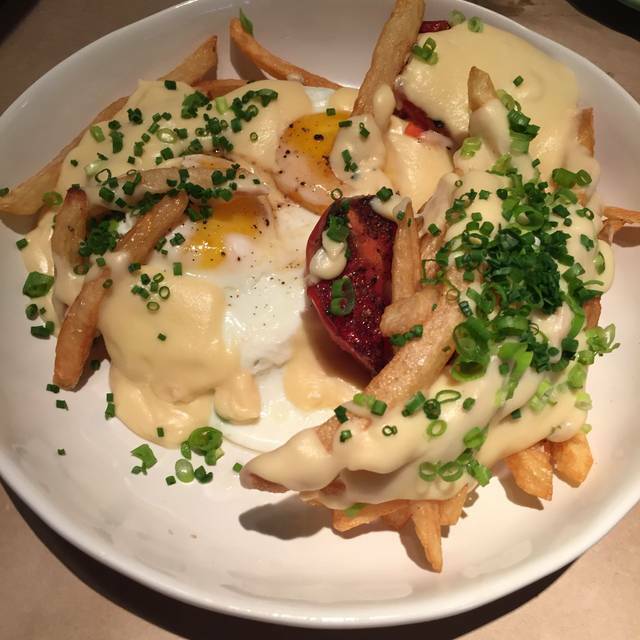 Great atmosphere, great drinks, great brunch! I go pretty often and this past time I went our server let us know that they were short-staffed and just wanted to manage the expectations that there could be a delay in service. That was refreshing, but we still received timely and courteous service and didn't really notice a lag in receiving any of our food/drink. They've never given me a reason to not keep coming back. We booked a reservation and arrived on time. The hostess booked tables incorrectly, and gave our table away. We waited 30-40 minutes, and the hostess was not kind or sympathetic at all. Our waiter was slow and paid very little attention to our table. We’ve got to One Eared Stag multiple times...we are regulars. This was disappointing. It took 20 minutes to get cocktails after ordering. The fish was soggy and bland. The rabbit was over cooked & tough. The quail was dry and impossible to debone. Service was slow. We had to finally ask the hostess to bring us some salt. We went with high expectations and were completely disappointed. Quiet, pleasant dinner. Not crowded (thought more folks would be there). Good food. Great waiter with good wine knowledge. Amazing service and food quality. The Loup de Mer was delicious and everything was beautifully plated. Whole wheat pound cake was a little dry but to be expected. There was a fly in my eggs. 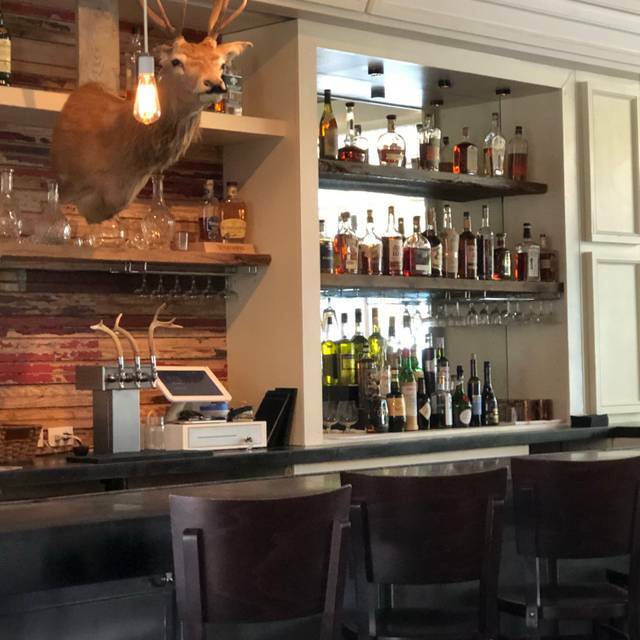 I love the ambience at One Eared Stag — it makes it a favorite place to meet a friend for lunch on a regular basis and catch up over oysters and a glass of wine. The only problem is that we have a tough time deciding between the grilled cheese and soup or the not-on-the-menu cheeseburger! I think they are both the best in town, perhaps the best I've ever had in my life. I also love the foodie factor at One Eared Stag. My family and I are actually headed back tonight with some out-of-town relatives for Fried Chicken Night (Mondays). Can't wait! I almost hate to post this because our food experience was possibly the worst I’ve ever experienced any place and I’ve traveled all over the country and the world as well. Our party arrived at 7:30 on a Saturday evening and we were seated promptly. We placed our order within 15 minutes. We were advised that the whole fish was not available. We also were told the burger was not available. 7:30on a Saturday night !?!? We therefore ordered items that are unusual but when well prepared can be very good. Cow tongue was ordered by one of our party and rabbit leg confit by another. Another ordered 2 small plates. Our food was finally served one and a half hours after we were seated. In a nut shell the cow tongue was like a piece of shoe leather, could not be cut or chewed. The rabbit confit was also cold and tough and not at all eatable. 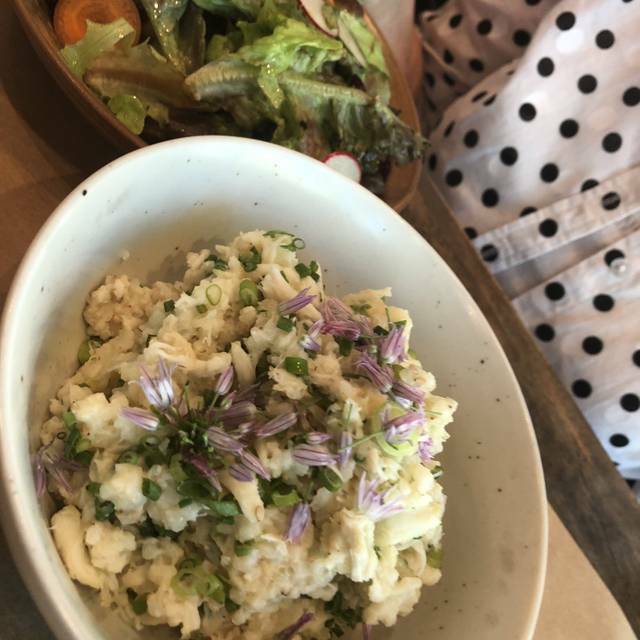 One of the side dishes ordered by a third party was pork and inedible because it was mostly raw. Fortunately our fourth had a decent meal. Really a very bad experience by 3 of 4 of our party. We will never return. I had been several years ago and it was great, but I had forgotten how expensive it is. The cocktails were the highlight of our visit. They were out of the burger at 6:30 on a Saturday so We got a number of appetizers that were all good, but nothing I'd say was amazing. We had fried dates, Nashville hot chicken on bread, and bread and cheese. I also got the pork "porterhouse" which turned out to be a very normal sized bone in pork chop that cost $30. It was kind of dry and a little tough and overall a big let down. I guess labelling a pork chop as a "porterhouse" is how you justify the massive price markup. I doubt I'll go back unless it's to get the burger. I really wanted this to be a good experience because I’ve heard good things about it but I don’t see myself coming back any time soon. Our server was nice but rather negligent or maybe just weeded. He spent a lot of time sitting at the table next to us and talking, which usually wouldn’t bother me but i was trying to get his attention and he ended up forgetting a part of my order and when I brought it up to him it was 86ed. There was only one dish that I liked and that was the lobster grits. The dutch baby was would of been good in theory but it went a little to extreme on both sides of the spectrum of savory and sweet for my taste. I try to be very understanding of servers and what they go through, especially during brunch but if you feel cool enough to sit at tables and chat, make sure you are not letting your other tables service fall short. First time going and it was an awesome experience. I will be going back! I will recommend to friends. Great service and a delicious menu. Looking forward to dining there again very soon. I love this style of dining! Tenaciously ingredient-driven and totally unpretentious. 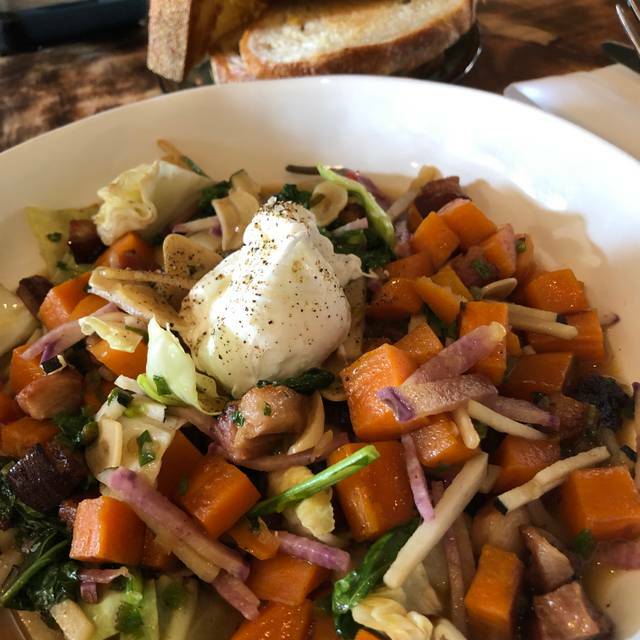 Decor is antique, white paneling that focuses everything back on the food and your dining partners seated with you on weathered church pews and surrounded by colorful jars of vegetables, preserving around the room. 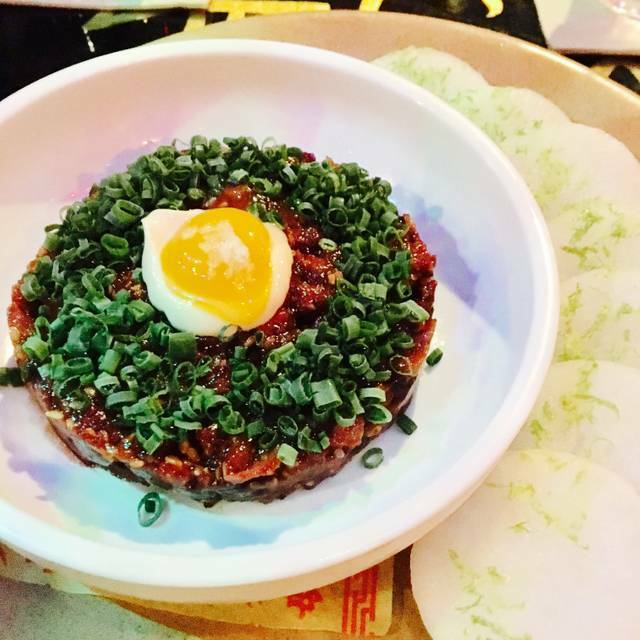 Young clientele, carefree atmosphere, but very serious about the food itself. My ideal dining experience! Tried multiple times to get a reservation here. Glad I persevered! Overall great experience. Service was excellent appetizers were creative and very tasty. Four different entrees at our table and all enjoyed sharing. Desserts top notch (tried two of these as well). Bar seemed very busy. We had two different wines, both moderately priced French blends which were nice. Wine list is not extensive but geographically diverse and appreciated. We were there for about 2.5 hours and enjoyed the experience. I will return and highly recommend. I took my mother here for a birthday brunch. We enjoyed the atmosphere, the food was great and the waiter was amazing. We appreciated the waiter‘s ability to anticipate what we needed next based on what we ordered and our questions. Looking forward to another visit to try other items. 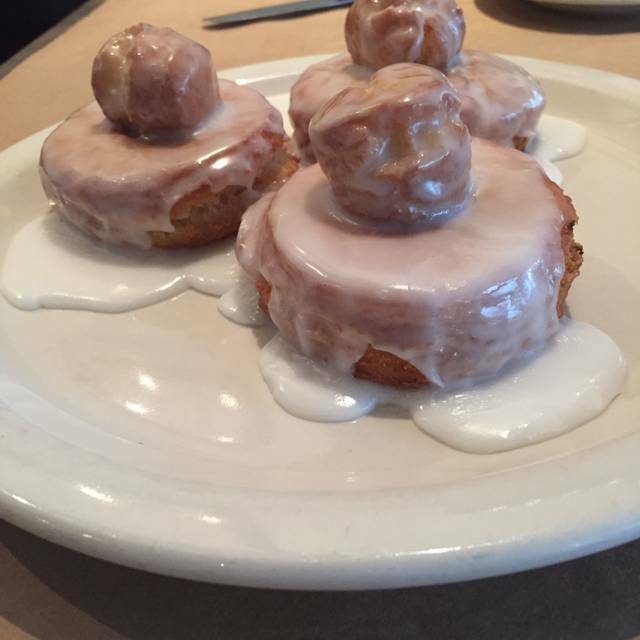 Love the biscuit, homemade jam, and doughnuts. Slow service, confusion around seating, very loud atmosphere and very mediocre food at high price point for Atlanta. The 2 dishes with kimchee were sooooo small. My friends were shocked. Absolutely amazing from start to finish. The server was extremely knowledgeable, friendly, and gave some amazing recommendations. We started with the biscuits and gravy then ordered the platter which came with some of the most amazing bacon and grits, spicy chicken sandwich, and other items. In addition we got a bacon hash that was to die for. There are just not enough ways to praise this dining experience. Awesome!!! From start to finish, everything was superb! First time visiting, everything was superb, and we cant wait to come back. Delicious textures. Great service. Very very good food. A fun spot with a creative menu and good ingredients, but quality control seems to be a real problem for them. 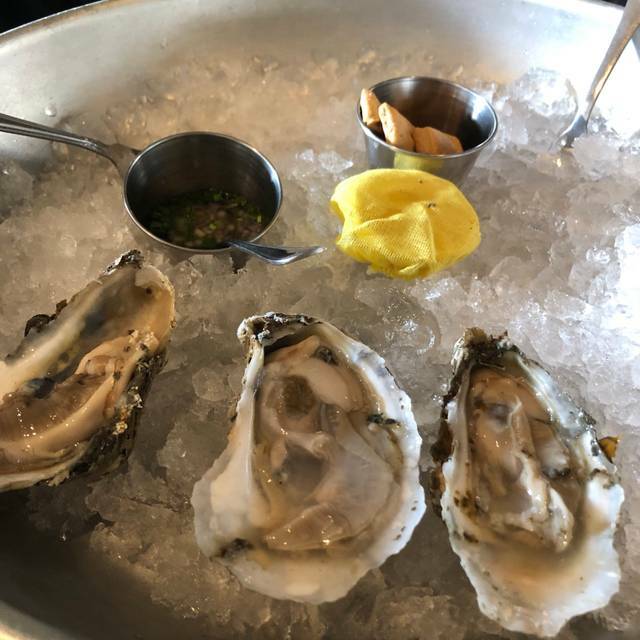 We ordered raw oysters that could have been wonderful, but they were mangled during the shucking process and rinsed, robbing them of most of their flavor. My "soft scrambled eggs" were actually curdled — a waste of the beautiful lobster meat they were scrambled with. Overall a disappointing meal, especially for the price. This place never fails me. They were out of one of their 5 entree options by 8 oclock. Small plates, entrees, and cocktails were all phenomenal. 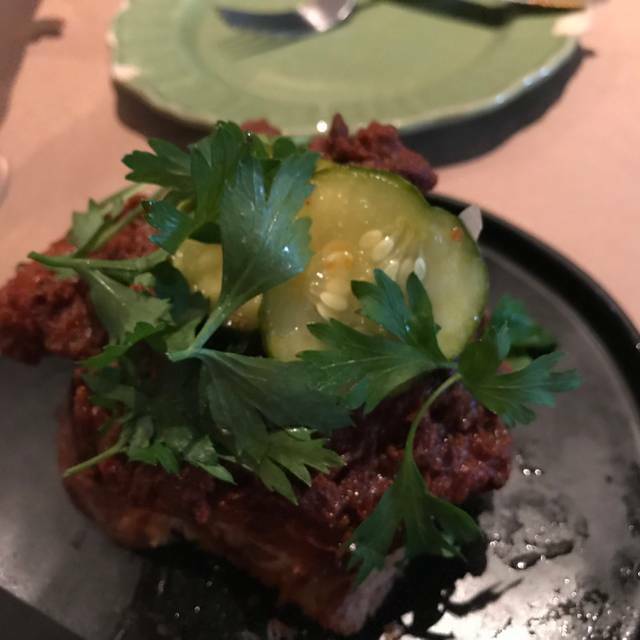 The hot chicken small plate was great. The beef tongue pie was amazing. The dessert (sponge cake) was small and really just OK. Our server was fantastic. The only thing we weren't please with was the seating. I'd made reservations weeks in advance for valentine's day. Since we have a toddler at home we made early reservations (6pm). The restaurant was not very busy when we arrived and there were multiple tables open in the main dining area. However, we were seated at a high top in the bar area that was tucked in the back near the kitchen and bathrooms. I asked the hostess for another table and was placed by the front window which was nice, but we were still in the bar area. It's not a huge deal and the rest of the night was great. Just a little bit annoying. Food was very good, but the appetizers are a bit expensive for the portion. Server seemed to be having a bad day, we could forgive bad service if the food had been great. Unfortunately, it wasn't. Skip it. We went there for Valentine’s Day it was perfect for that. The foods are really exotic fantastic. The prices are fairly high, which is why I would go there only on very special occasions. Lots of exotic cocktails if you’re into that.We’re not super big eating eaters so for us personally we could’ve done fine only doing appetizers and had a great experience. Having only one waiter was not very efficient. We were there an hour and thirty minutes which is way too long for lunch even a casual lunch. Food is worth coming back for but not unless you bring a book or tablet. 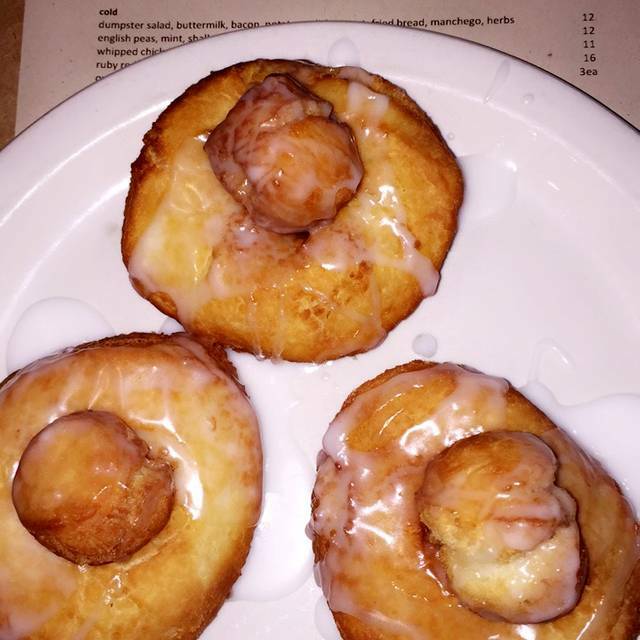 The craft cocktails were very well done and thoroughly enjoyed the glazed donuts as a dessert! Sunday evening is a great choice of time to go grab after-dinner cocktails and dessert! It is in a unique part of town and has a quaint atmosphere. The food and service was better than expected! A bit slow on the food to come out after an order but worth the wait. With all the choices available these days, I am not sure. Service was slow; not the server but food took forever. I could see things were off because I noticed that tables were not bussed for a long time and I know that indicates something is up. The host had no idea when we showed up how to manage finding us a table as she disappeared 3 times. Finally, even though we had a reservation and asked for a standard table, she took me to a high top, but changed it when I asked (found out later that she had no idea because Open Table emailed me asking why I was a no show, so then that was additional emailing to say, we were there and in fact spent $300+ tip for 2 bottles of wine; 2 apps; 3 entrees, so I think the value just wasn't there (4 of us). Great Ambiance with great food and cocktails. The chicken confit was to die for.